Aponeuroses (plural of aponeurosis: απο, "away" or "of", and νευρον, "sinew", and pronounced ap·o·neu·ro·sis) are layers of flat broad tendons. They have a shiny, whitish-silvery color, are histologically similar to tendons, and are very sparingly supplied with blood vessels and nerves. When dissected, aponeuroses are papery and peel off by sections. The primary regions with thick aponeurosis are in the ventral abdominal region, the dorsal lumbar region, the ventriculus in birds, and the palmar and plantar regions. Their primary function is to join muscles and the body parts the muscles act upon, whether it be bone or muscle. The anterior abdominal aponeuroses are located just superficial to the rectus abdominis muscle. It has for its borders the external oblique, pectoralis muscles, and the latissimus dorsi. 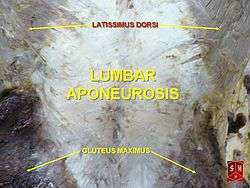 The posterior lumbar aponeuroses are situated just on top of the epaxial muscles of the thorax, which are multifidus spinae and Sacrospinalis. The palmar aponeuroses occur on the palms of the hands. The extensor hoods are aponeuroses at the back of the fingers. The plantar aponeuroses occur on the plantar aspect of the foot. They extend from the calcaneal tuberosity then diverge to connect to the bones, ligaments and the dermis of the skin around the distal part of the metatarsal bones. The anterior and posterior intercostal membranes are aponeuroses located between the ribs and are continuations of the external and internal intercostal muscles, respectively. The aponeurosis (or galea aponeurotica) is a tough layer of dense fibrous tissue which runs from the frontalis muscle anteriorly to the occipitalis posteriorly. Pennate muscles, in which the muscle fibers are oriented at an angle to the line of action, typically have two aponeuroses. Muscle fibers connect one to the other, and each aponeurosis thins into a tendon which attaches to bone at the origin or insertion site. Like tendons, aponeuroses attached to pennate muscles can be stretched by the forces of muscular contraction, absorbing energy like a spring and returning it when they recoil to unloaded conditions. ↑ McCracken, Thomas (1999). New Atlas of Human Anatomy. China: Metro Books. pp. 78–79. ISBN 1-5866-3097-0. ↑ Azizi, Emanuel; Roberts, Thomas J. (2009). "Biaxial strain and variable stiffness in aponeuroses". The Journal of Physiology. 587 (17): 4309–18. doi:10.1113/jphysiol.2009.173690. PMC 2754367 . PMID 19596897. This article incorporates text from a publication now in the public domain: Chisholm, Hugh, ed. (1911). "Aponeurosis". Encyclopædia Britannica (11th ed.). Cambridge University Press.